As social media networks have been assimilated by younger generations, it was only a matter of time until the older generations would catch up. From the table above, it can be clearly seen that there is little room for growth for social media in the Millenial and Generation X age groups. However, there is a lot of room for penetration in the Baby Boomer and Mature demographics. What causes the adoption of social media networks by older generations? Here are 2 potential causes. 1. Baby boomers want to overcome health and mobility issues. Judith, a 60-year-old woman from New Jersey is a disabled widow who spends most of her days and nights sitting at home due to Parkinson’s Disease. She doesn’t have many surviving friends and needed some sort of human interaction to help keep her sane. Dennis, a 57-year-old San Jose homebound resident with colon cancer, found himself a victim of social isolation brought on by his chemotherapy therapy. Dennis was stuck at home while his wife and daughter lived their “ordinary” lives, leaving him at home with a disease that made him feel so isolated from the world. Judith and Dennis are just a small sample of the mix of health and mobility that invade the lives of older Americans. Social media allows to overcome these barriers and empowers them to connect with family and friends. 2. Baby Boomers want to have fun. Yes, you read that right. This ties in with the previous factor: health and mobility barriers prevent baby boomers from having fun. The rise of the social games industry has been partly fueled by their increased used of the Internet and social networks. This would make sense why social gaming sites that highlight collaboration and social interaction such as Winster.com are gaining a strong following of baby boomers. With over 2.1 million unique visitors in February 2011 (according to data from Compete), Winster.com has an appealing proposal to baby boomers: it offers the opportunity to play casual games as a social outlet, which encourages positive interaction with each other, enabling trust and friendships to develop. 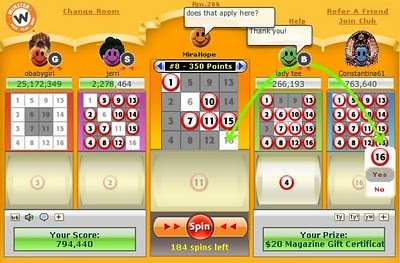 As you can see from the screen shot above, the layout of this bingo game from Winster.com is simple yet very user friendly. Unlike social games from Zynga such as FarmVille, these games are multiplayer, synchronous, and collaborative games played in real time. The Baby Boomer generation will further adopt social media to satisfy their social needs and to overcome their health and mobility barriers. Also, boomers have taken an interest in social gaming platforms that allows them to interact with peers, make friends, and have fun.